The couch gag in “Fears Of A Clown” sees Lisa pointing out that, in four episodes’ time, The Simpsons will officially pass Gunsmoke to become the longest-running scripted TV show of all time. Congratulations are most definitely in order, even if nay-sayers and killjoy TV critics can’t mantion the show without sniffing that The Simpsons’ last “good season” was nearly two decades ago. But The Simpsons’ legacy isn’t so easily brushed aside even now, as a handful of fine seasons can be cobbled together from episodes from the post-classic seasons, and the show is more harshly judged against itself than against any baseline of acceptable sitcom quality. Then again, sometimes The Simpsons rolls out an episode that’s so pale an approximation of its best that sticking up for it becomes an exercise in hand-waving and deep, deep sighs. “Fears Of A Clown” isn’t good. It’s also not bad. It is, instead, irrelevant in its hollow echoes of past, actually memorable, episodes. When the book on The Simpsons is finally closed (perhaps after next season), and the inevitable all-time episode rankings are compiled, “Fears Of A Clown” is one of those installments destined to elicit blank stares, even from die-hard fans. It barely exists. Plotting discipline remains one of latter-day Simpsons’ most dispiriting weaknesses, with the least memorable episodes heaping unrealized A- through C-stories atop each other as if hoping quantity will distract from how little of substance in happening. Here, on the April 1 episode, there’s a Bart vs. Skinner prank war, where Skinner gets some elaborate revenge (involving glue, bird seed, and a retirement rumor) that seems destined to throw the nemeses’ power balance all out of whack. Instead, Bart’s humiliation is sped by like the Springfield Elementary teachers tossing a Nelson-style “Haw-haw!” at Bart from a speeding car, and Bart’s revenge (involving more glue and a whole lot of clown masks) looks to take over the narrative. Nope—Bart’s ambitious reign of terror makes clowns the most hated figures in town, which costs Krusty his career, again. Splintering even further, the episode becomes both a Krusty comeback story and another “Marge is so disappointed in Bart” story, the scattered scraps of plot so tenuously connected and shruggingly realized that the whole episode just evaporates as you’re watching it. None of these stories is a bad idea in itself. Recent Simpsons seasons have offered some genuinely fine new takes on themes and relationships that have already been done several times (or more) over. But doing so requires either an abundance of great jokes or a something new to say, and neither bar is cleared here. Krusty’s career crises (or “Krusty’s Kareer Krises”) continue with his abrupt cancellation as kids performer seeing him turning to serious drama. Or as serious as it gets when the local theater production of Death Of A Salesman he embarks upon is directed by noted hack Llewelyn Sinclair and uses a royalty-free bastardized script called The Salesman’s Bad Day. (It also co-stars movie star Rainer Wolfcastle alongside the likes of Apu and Lindsey Naegle, for some inexplicable reason.) 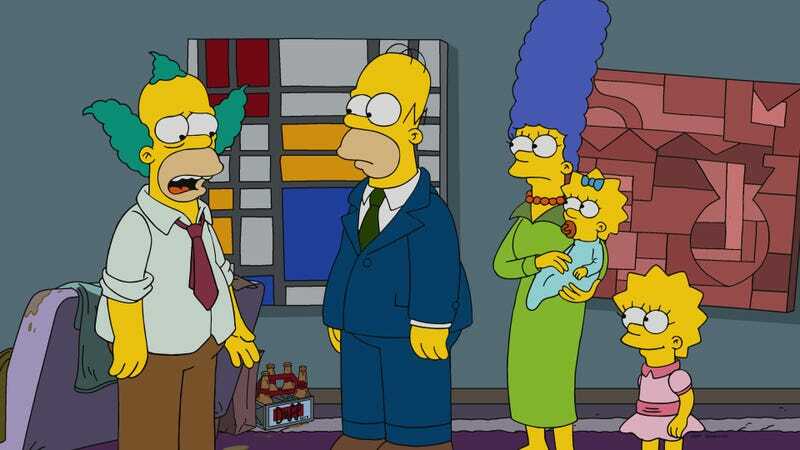 Lovitz’s participation recalls “A Streetcar Named Marge,” Krusty’s self-reinvention recalls “The Last Temptation Of Krust,” and it’s a lot more fun to recall those episodes than it is to watch this one. Similarly, Bart’s li’l bastardy has seen him drummed out of school and into some far more interesting places than the truncated stay at the juvenile delinquent rehab he winds up at here. The same goes for the equally short-changed mother-son dynamic that sees Marge urging the juvenile court judge (a squandered Andy Daly) to throw the book at her perennially wayward boy, in the hopes of pulling him back from the permanent record hell he’s seemingly headed for. Marge’s desperate love for Bart provided the foundation for one of the most satisfyingly emotional Simpsons episodes ever, and has resurfaced to not-inconsiderable effect since. But here, Marge’s fears are dispensed with with in a few lines targeted at the “boys will be boys” mindset that she blames for Bart’s revolving-door punishment dynamic. And Bart’s change of heart comes down to an exact replay of the tack on the chair dilemma that endangered his mom’s (here lovingly rendered) bottom back when Marge was a substitute teacher. Again, there’s nothing that says a gag can’t be reused, but with so little else to recommend it here, the only thing accomplished is to remind viewers of the good old days. Homer points out the striking design similarity between himself and the makeup-less Krusty (along with Louann and Kirk, and others). The self-referential gag would be better if Homer’s cry “Why is this universe so lazy?” weren’t, well, you get it. I laughed once in the episode, unsurprisingly thanks to Milhouse, whose response to the sight of Bart’s water balloon prank (“It’s times like these I’m glad I have eyebrows!”) holds just the right amount of time before his expressive eyebrows raise in appreciation. 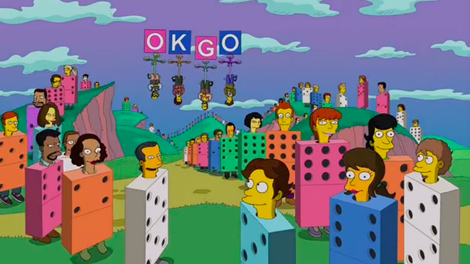 Take that, OK Go. I guess. 10 Simpsons from the last 10 seasons that aren’t the... Worst. Episodes. Ever.